If you believe in Santa Claus and have plans to leave cookies out for him late on Christmas Eve, you may not want to read this. Then again, if you are a strong believer, but still wonder where this bearded gift-giver came from, you just might be interested in this brief history lesson on the real St. Nick. He was born in 270 A.D. in a Greek village in Asia Minor to wealthy parents who died during a plague. His early Christian religious devotion led him to become Bishop Nikolaos of Myra, and a venerated saint of Myra in Lycia, today known as Demre on the coast of modern-day Turkey. In the year 325, Nikolaos attended the Council of Nicea at the request of Emperor Constantine, where he staunchly defended the divinity of Jesus Christ. He was also known for bestowing gold coins to those in need, even dropping down a chimney on one occasion to leave coins in a young woman’s stockings that had been hung up to dry by the fire. Sound familiar? Like me, you may be wondering how Santa got from the Mediterranean to the North Pole. Well, that all began when the Seljuk Turks invaded Myra in about 1060, driving out the Byzantine Christians. By then, the legend of St. Nikolaos’ generosity and benevolence had spread throughout the Christian world. Because he was said to have performed miracles, including the resurrection of murdered innocents, he was known by some as Nikolaos the Wonderworker. As with other saints, Nikolaos’ bones and relics were considered to have magical powers, and therefore were highly prized for pilgrimage sites. Knowing that pious pilgrims will travel far and wide to touch such things, a group of enterprising Italians removed the bones of Nikolaos from Myra and placed them in a church in Bari, Italy. Other fragments wound up in Venice, where the saint became a patron of sailors. Still other bits found their way to Germany, where his tale was mixed with northern European myths and legends. 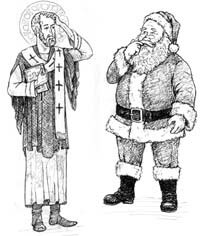 In late medieval England, on Dec. 6, Saint Nicholas’ Day, parishes held Yuletide “boy bishop” celebrations in which youths acted like priests and bishops, and exercised rule over their elders. Saint Nicholas became celebrated as a great gift-giver. Nuns celebrated him by depositing baskets of food and clothes anonymously at the doorsteps of the needy. Sailors in some countries celebrated him in harbor towns, stopping at “Nicholas fairs” to buy some goods and gifts for their loved ones, including little presents for the children. A Dutch winter visitor, named Sinterklaas today, looks like Santa but wears a bishop’s hat with a cross on it and is a lot less jolly looking. By the time Santa Claus made it to America he was a rotund, white-bearded man in a red suit, generous as ever but without all the religious trappings. He rode reindeer, which he must have picked up in Scandinavia among the Lapland tribes, who live about as close to the North Pole as anyone. I suspect that he picked up some elves on his way through Ireland, but cannot confirm this. Santa Claus became a Christmas institution in the United States only in the 1860s, helped by Harper’s magazine illustrations and stories by Washington Irving. The big man in the red suit helped return Christmas from the drunken bash it had become back to a family-oriented time of gift-giving and generosity. Santa also added a big dose of commerce to the religious holiday that celebrates the birth of Jesus Christ. “Rudolph the Red-Nosed Reindeer” began as an advertising jingle for Montgomery Ward shopping centers. Since World War II, American servicemen have distributed gifts to children around the world during Christmas, dressed in red suits and wearing white beards. This image of American Santa also traveled the world for decades on Coca-Cola bottles, and has come to represent the American spirit of generosity and goodwill during the holidays. Even the small city of Demre, in modern-day Turkey, the original home of St. Nikolaos, displays statues and figurines of American Santa, designed to catch the eye of homesick pilgrims—I mean tourists. Santa has finally come home after his long journey, but looks very much out of place on tourist brochures in that Muslim country. In 1993, a grave was found on the small Turkish island of Gemile, east of Rhodes, which historians believe is the grave of Saint Nikolaos. Here you can walk among crumbling ruins of fourth- and fifth-century chapels and monasteries, where St. Nikolaos lived and worshipped. It is a good place to consider how holiday traditions, no matter how they change shape, make sure good deeds are never forgotten.